LAWRENCE — Sink or swim? The minds behind the University of Kansas entry in this month’s concrete canoe competition hope to do neither. Instead, they hope their entry will float and be fast, with a design that can impress judges and win races. “It's a pretty sturdy boat,” said Joe Roubinek, a junior in civil engineering from Merriam. He’s leading a 25-person team, made up of students in the School of Engineering, who have spent the year designing and building their entry. The regional competition, sponsored by the American Society of Civil Engineers and hosted this year April 19-21 at Southern Illinois University-Carbondale, is part of the Mid-Continent Student Conference of the American Society of Civil Engineers. The competition has several components: Teams must build the canoes — KU has been at work on design and construction since this year’s rules were released in the fall — and make a presentation about the project. At least one major rule changes every year so that winning teams can’t rest on their laurels; everybody must go back to the drawing board and start from scratch. 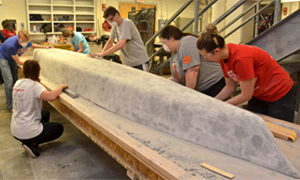 Last year’s team faced a change in rules about the type of concrete mix used to build the canoe. That change is still a major challenge this year, Roubinek said, as teams struggle to figure out the best replacement. "They release the rules in mid-semester, fall semester, so you don't have a lot of time to figure it out,” Roubinek said. After judges examine the canoe (ensuring, yes, that they can float), another moment of truth: KU will pit its creation against other universities’ canoes in a series of races — two long-distance races featuring two-person men and women’s teams, and three sprint races featuring two-person men and women’s teams, plus a four-person co-ed team. Besides putting their paddling skills to use, KU engineering students also put their classroom lessons to work in an applied setting. "There's a lot of practical knowledge you get out of it,” Roubinek said of the competition. “We work a lot with concrete. You get a lot of experimentation, so you learn how to approach a project. There's a lot of problem-solving. Anything that can go wrong will go wrong, so you have to stay on your toes for all the issues that come up."